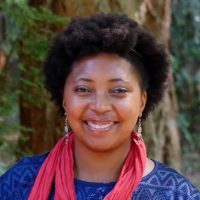 Simangele Mabena has roots in the Nguni tribe of Southern Africa, is a PhD student in LLED and is a Public Scholar. With a background in theatre and Deaf Studies, her research is a blend of research-based theatre in the examination of the literacy education of multilingual Deaf learners in South Africa. She is passionate about equitable and multilingual literacy education for Deaf learners in the African continent. She is also a lover of tea, Argentine tango & salsa, diffuser oils and naartjies.